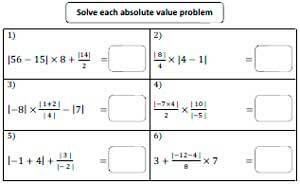 Free absolute value worksheets include absolute value of positive and negative integers; simple addition, subtraction, multiplication and division involving absolute value of real numbers and more. Find the absolute value of the integers. These worksheets are great for beginners. These worksheets include absolute value with or without negative sign. Add two absolute value of integers. Subtract two absolute value of integers. It includes both addition and subtraction of absolute value of integers. Multiply two absolute value of integers. Divide two absolute value of integers. It includes both multiplication and division of absolute value of integers. Simplify the absolute value that includes addition and subtraction of two integers. Simplify the terms that includes both multiplication and division. It includes all the four operations in each worksheet. Use PEMDAS to solve the absolute value problems.